My mom and I spent Veterans Day at two ceremonies. 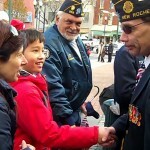 In the morning we went to Memorial Plaza in New Rochelle. 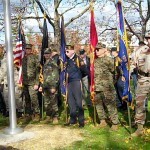 The United Veterans Memorial and Patriotic Association (in cooperation with City of New Rochelle Department of Parks & Recreation) held the Veterans Day Ceremony. The people who spoke were Mr. Peter Parente, Mayor Noam Bramson, who was just re-elected, and Mr. Tocci who is a former New York State Assemblyman, former New York State Commissioner of Veterans Affairs, and had been elected to the Veterans Hall of Fame. 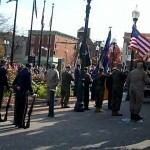 Many individuals and businesses were honored by the UVMPA because of their contributions to the Memorial Day event. Some of the neighbors who were honored were the New Rochelle Fire Department, New Rochelle Chevrolet, Monroe College, the USO Liberty Belles and our friend Alan of AJ Burgers! The New Rochelle Fire Chief received a special flag from Afghanistan. I saw Mrs. Mickie Fosina there. Micki Fosina is a friend and a wonderful lady. There will be more about her in a future blog. 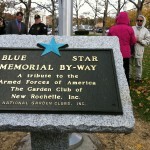 When I saw the Blue Star By- Way Marker I felt sad knowing these families could possibly lose a member of the family. I also felt like they accomplished something that I just can’t explain. I am happy that my community recognizes the Blue Star families. I would also like to thank Mr. James Maisano for being a Veteran and our County Legislator. Thank you to Mr. Parente for organizing the event. Thank you to the Brown family for coming to the morning ceremony with us and for your friendship. And most importantly, thank you to all of the Blue and Gold Star Families.